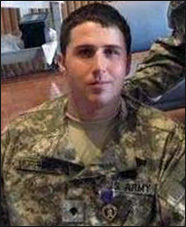 Army Corporal Jesse Murphree joined the military in 2005 because some of his family is from New York City and were affected by the terrorist attacks on September 11, 2001. He wanted to serve his family and country. On December 27, 2007, Corporal Murphree’s unit was on an overwatch mission in the Korangal Valley, near Ali Abad, Afghanistan. Murphree served as the gunner on an up-armored Humvee. It had been assessed that there would be enemy combat in the area. The unit moved out with four trucks and was positioned to see enemy activities. During a five-hour period, the unit detained two prisoners. Just as they were set to return to the base, Corporal Murphree’s vehicle was blown up by a Russian anti-tank mine. He was thrown down the side of a mountain and could not be found for five to ten minutes while the two sides engaged in a firefight. Corporal Murphree woke up on his stomach in a known enemy location. He realized that his arm had snapped and his legs were shredded. When members of his unit got to him, they rushed him back to the base for the medevac. Twice he had to be resuscitated on the helicopter. He woke up almost two weeks later at Walter Reed. Corporal Murphree lost both legs above the knee, suffered a traumatic brain injury, has been diagnosed with PTSD, and has nerve damage to his right forearm. Among the commendations awarded to Corporal Murphree were the Purple Heart, Bronze Star Medal, Army Good Conduct Medal, National Defense Service Medal, Afghanistan Campaign Medal with Two Campaign Stars, Global War on Terrorism Service Medal, Army Service Ribbon, NATO Medal, Combat Infantry Badge, and the Parachutist Badge. Building Homes for Heroes gifted a home to Corporal Murphree, his wife Ashley, and son Brody in Central Florida in September of 2015.